1) Preheat the oven to 190C/375F/Gas 5. Grease and line two 23cm sandwich tins. 2) For the brownie base, melt 180g of the chocolate in a bowl and set over a pan of simmering water. Chop the remaining chocolate and set aside. 4) Gradually beat in the flour until the mixture is very smooth. 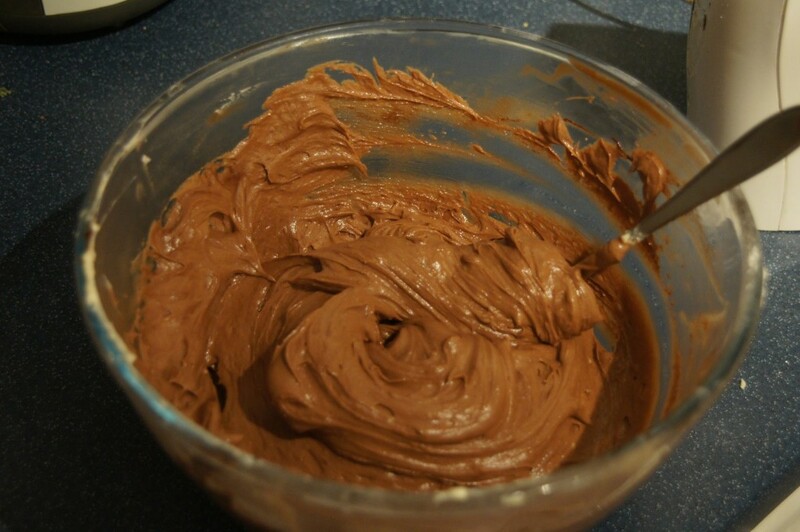 Slowly pour in the melted chocolate and fold it into the mixture, then fold in the chopped chocolate. 5) Pour the brownie mixture into the prepared sandwich tins and bake for 10-12 minutes. Reduce the oven temperature to 170C/325F/Gas 3. 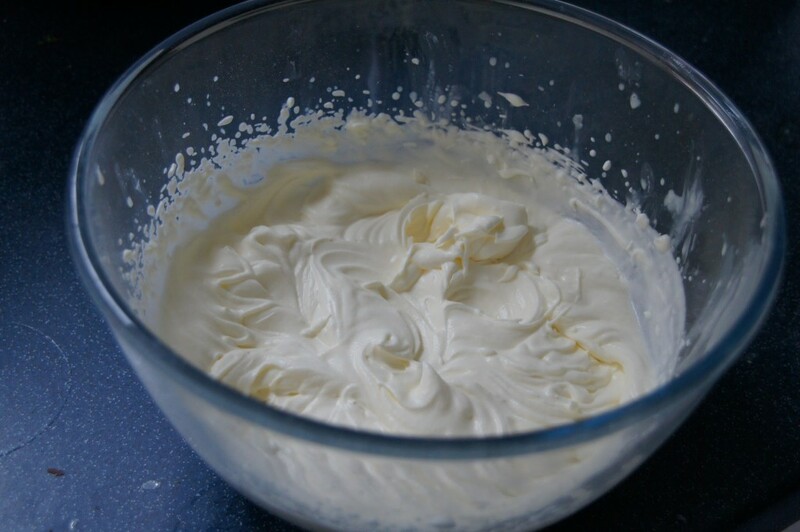 6) Meanwhile for the meringue topping, whisk the egg whites and cream of tartar in a bowl until soft peaks form when the whisk is removed (I think I probably stopped whisking a little bit too early and should have carried on a little longer). Slowly which the sugar until smooth and glossy, then fold in the chopped hazelnuts with a metal spoon. 7) Spoon the meringue topping onto the cooked brownie base. Use a palette knife to smooth the meringue mixture in one sandwich tin and use a skewer to make peaks in the meringue mixture in the other tin (I failed here as I don’t think I whisked my meringue enough for the peaks to hold). 8) Return the sandwich tins to the oven for a further 30 minutes, or until the meringue is golden-brown (I check mine just after 20 minutes and they were ready then.) Remove from the oven and set aside to cool. Carefully remove the cakes from the tin and set aside to cool completely on a wire rack. 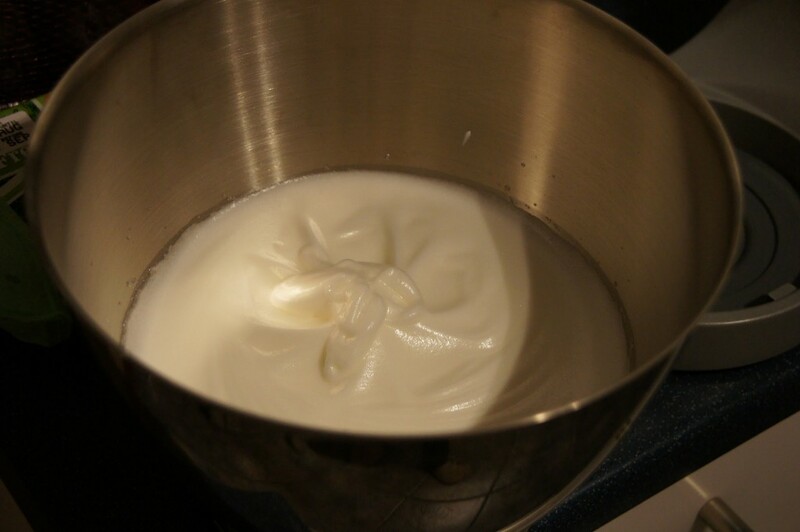 9) For the filling, whip the cream and icing sugar together in a bowl until stiff peaks form when the whisk is removed (again I think I failed in my whisking here!) Fold in the raspberries. 10) To assemble, place the flat meringue brownie, meringue-side down onto a cake stand or large plate, spoon over the raspberry cream and top with the remaining cake, brownie-side down (this is tricky – this is where my cracking took place). As an optional extra you can sprinkle over chopped hazelnuts and pistachios. 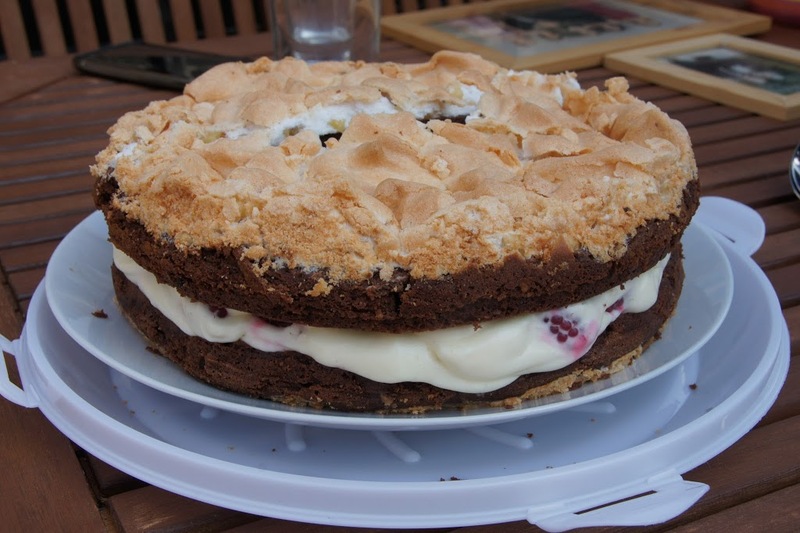 The Chocolate Brownie Meringue Cake AKA Beautifully Baked Reunion Cake. A delicious and satisfying cake with it’s rich, squidgy brownie, sweet raspberry cream and those crunchy hazelnuts in the soft, sticky meringue. This is what cake will taste like in heaven!